A Photographic Review | It's Up 2 Us! The last few months have been full to brimming with exciting events, inspiring people and challenges. Here are a few highlights. The fight to resist Unconventional Gas Projects across our State (also known as Fracking) has really been heating up. 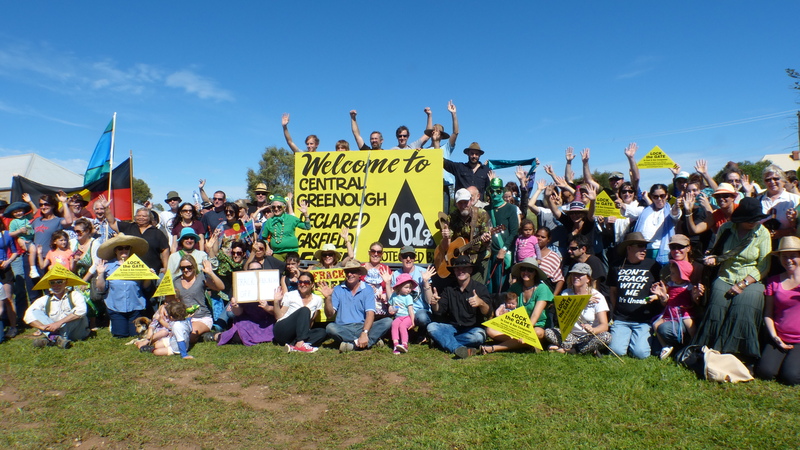 In July a number of us from Perth visited the Midwest to see what the industry has in store for the region and to celebrate with the community of Central Greenough as they declared themselves Gas Field Free. Central Greenough were the first community in WA to take this historic and courageous step and it was a privilege to be there with them. During my time in the region I met with a range of inspiring community leaders who are organising in their local communities to protect their land, water and our shared climate. The community opposition in the Midwest is strong as demonstrated by the Shire of Coorow’s town meeting with standing room only and a declaration to halt any further works. The community and their allies have successfully delayed work in the area and have plans to ensure this turns into a permanent ban on unconventional gas fracking. In recent months I’ve spoken at over a dozen public events some small and some quite large. Whether these presentations have been about Climate Change, Gas Fracking, Divestment or Civil Disobedience the reception has been high. It seems people are realising that It really is Up 2 Us to bring about the change we need. Of particular pride was the People’s Climate Mobilisation, a part of the International Peoples Climate Mobilisation led by 350 and Avaaz and hundreds of local community groups. Here in Perth we bought approx. 1000 people into the rain for an incredible event. With high profile speakers we secured mainstream media and engaged people in clear and specific actions they could take to make a difference. As an organising collective made up of over a dozen local groups we developed our capacity to collaborate and were humbled by the volunteers and new leadership. You can watch a clip made by Zebedee Parkes for Sustainable Energy Now about the event. In August we hosted a 3 day cross campaign Non Violent Direct Action training weekend upskilling over 60 activists, campaigners and everyday folk. With participants from 18 – 74 years of age we covered a broad range of concerns and demographics but what was clear was the willingness of people to step up to protect their communities and environment. Since then many of this group have come together for events and activities to protect our climate, our forests and our democracy. There’s much more to come. What’s not so easy to show an image of is the tremendous collaboration and alliance building that’s been happening in recent months, however if you look at the bottom of the image above you’ll see a small example. Here in WA we’ve seen an explosion in cooperation and collaboration. With Unions, Churches, Environmental Groups, Health Practitioners, Business Leaders, Social Justice Organisations, Political groups, Academics and Researchers coming together to share skills, resources and effort in addressing our local and global challenges. This has been a key focus of the It’s Up 2 Us campaign and this increased effectiveness has been noticed by our opponents with ever increasing hysteria and vitriol. 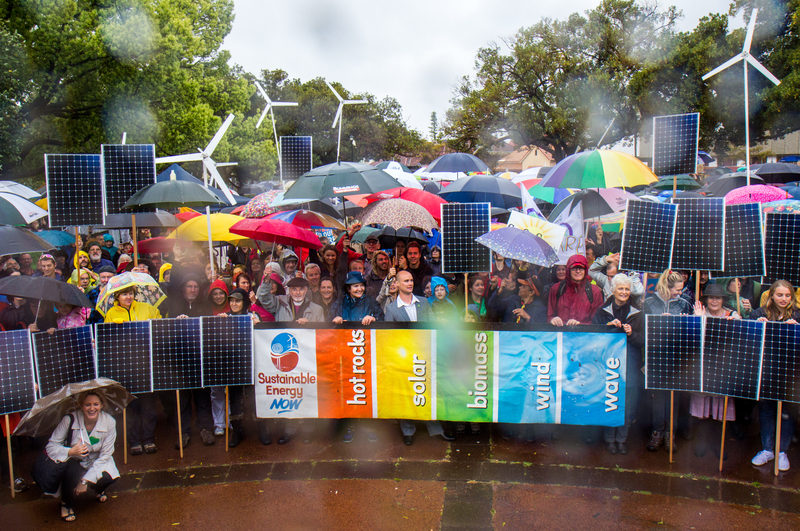 The power of Divestment continues to build with hundreds joining together for our recent National Divestment Day. 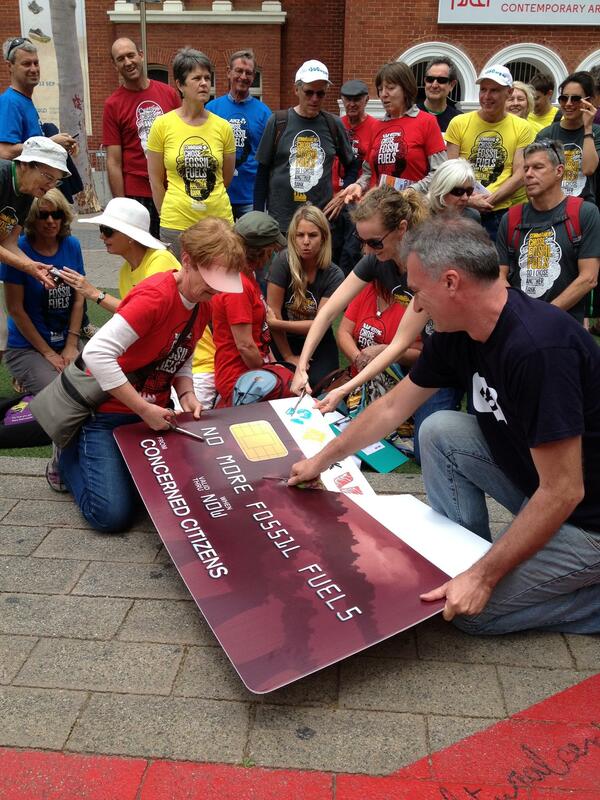 With a solid team of volunteers and a host of new participants we cut up our bank cards and shed our financial ties with those who fund climate destruction. 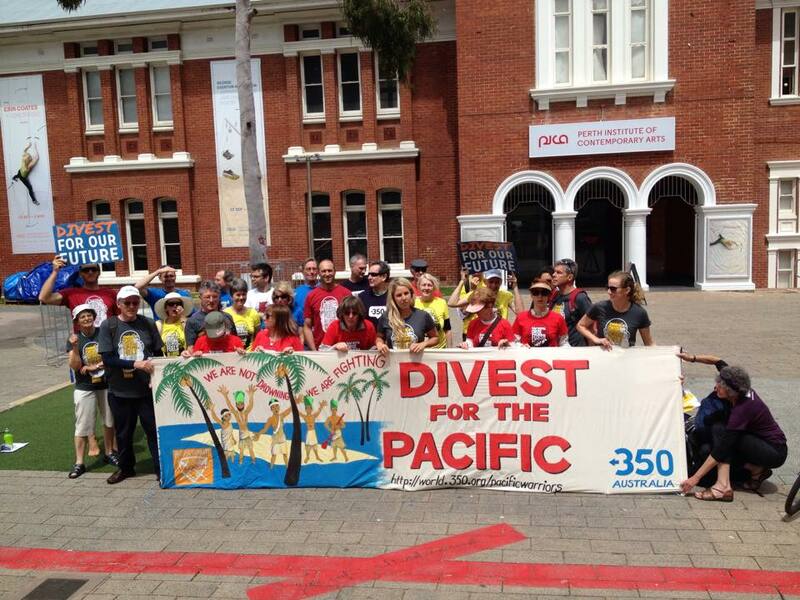 In WA we had events in Geraldton, Margaret River and Perth and are already planning the next major events to coincide with the International Day of Divestment mid February 2015. 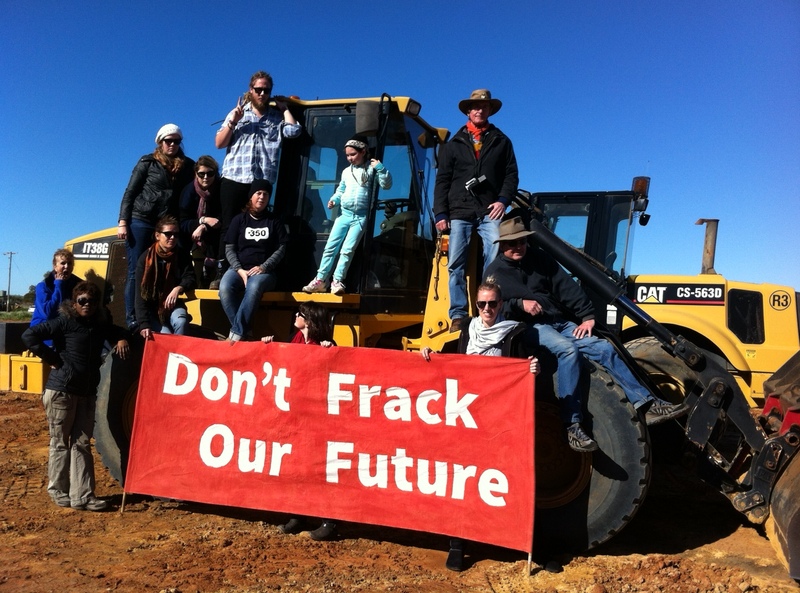 If you haven’t already taken this powerful action check out 350.org.au and rsvp at perth@350.org.au for our Feb events. And finally for this epic post to acknowledge the courage of everyday people standing up to the most powerful industry and vested interests we’ve ever experienced in our Human Story. Firstly to George and Daphne photographed above by Dean Leggo at Matilda Bay. 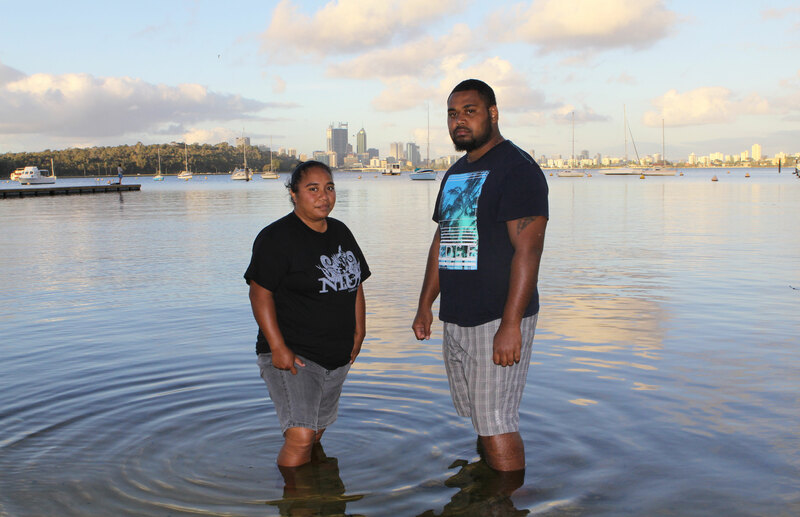 George from Fiji and Daphne from Niue travelled to Australia alongside 30 Pacific Islanders from 12 Nations to call on Australia to leave their coal and gas in the ground. You can find out more, including watching an inspiring film here. The Pacific Climate Warriors have a simple message, ‘We are not Drowning, We are Fighting’. Alongside Australians around the country the #ClimateWarriors took effective ‘direct action’ to slow down the expansion of the coal and gas industry and to highlight the human cost of climate change. 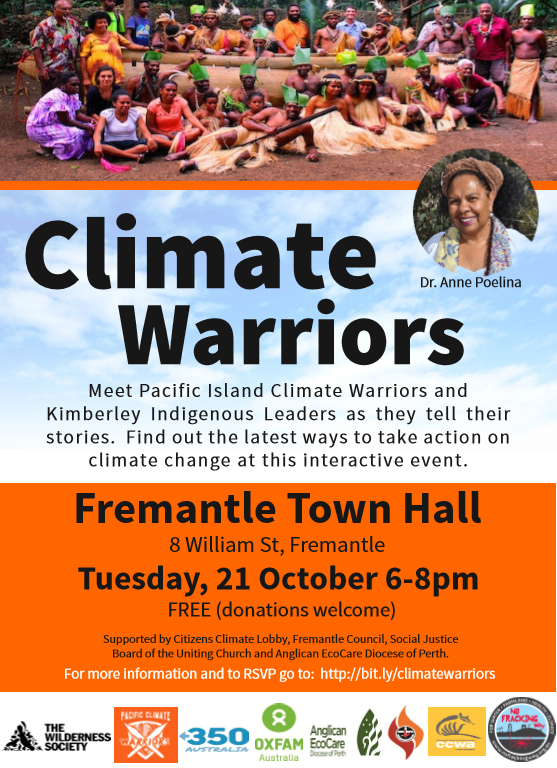 Here in Perth they met with various groups and shared their stories including a powerful night in Freo town hall (image above) where they discussed the effects of fossil fuel use on their homelands and we heard from Aboriginal Leader Dr Anne Poelina speak about the threats of invasive gas fields and extractive industries across the Kimberley. People Divested their bank accounts from Fossil Fuels in solidarity and we took on Buru Energy about their plans to Frack for Unconventional Gas. About 40 people were involved in a public action on Tuesday the 21st which included a Vigil held outside of the Buru Energy Headquarters and a Peaceful Occupation. The request was simple, we were calling on them to halt their plans for unconventional gas fracking and to transition to a 100% renewable energy company. 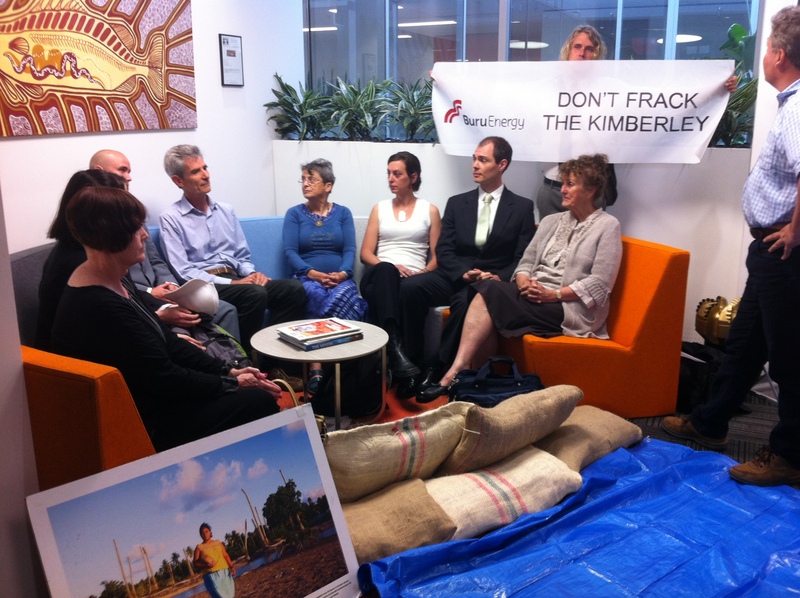 We peacefully occupied their office for 9 1/2 hours and shared messages from the Kimberley, the Pacific Islands and our own community expressing why we were taking the action. The small disruption we caused is nothing compared to the disruption those in the Pacific are experiencing due to climate change and the continued use of fossil fuels. Cathy a retired nurse aged 66 and Trish a retired social worker aged 74 were the final people to leave the offices of Buru Energy. They refused to leave until their requests were met or until they were arrested by the police. At approx. 6.30pm after an epic day of peaceful resistance and powerful solidarity they were arrested and charged with trespass. As I said at the beginning of this post it’s been a few months filled with exciting events, inspiring people and challenges. The Climate Movement is expanding and building it’s power. Every week we attract new people wanting to take action, people from all walks of life asking ‘what can I do?’ We are realising as a community that it really is Up 2 Us and as such we are beginning to respond appropriately. My work as a Climate Justice Campaigner is funded solely by members of the community. To make a tax deductible contribution go to this link.